At 31 pages in length, the Estate Tax return is daunting. It becomes worse when you consider that the only time you will encounter it is when a loved one has recently died. But when you dig into it, filing the form doesn’t have to be terribly complicated. Regarding its length, the good news is that many of the pages will probably not be relevant to the return you have to file. The form is actually only a 4-page return with 27 following pages of possible schedules to attach, mailing instructions, and other purely informational material. Unfortunately, you have to jump around between the various parts of the form to do it correctly. The easiest way is probably to fill out Parts 1 and 4, then Part 3, Part 5, Section D of Part 6, Part 2, then the rest of Part 6. Line 3b: “Year Domicile Established.” This refers to the year the decedent took up residence in their home state. Line 8: “If decedent died testate, check here.” “Testate” simply means that the decedent had a valid will. If the decedent had a will, the IRS would like to know and to see a copy of the will. Line 10: “If Schedule R-1 is attached, check here.” Schedule R-1 covers a specific form related to the Generation-Skipping Transfer Tax, which is a surtax applied to taxable gifts from grandparents to grandchildren. Line 11: “If you are estimating the value of assets…pursuant to the special rule of Reg. section 20.2010-2T(a)(7)(ii), check here.” The special rule is: if the taxable estate is less than the basic exclusion amount and you are filing the return solely to have the deceased spouse’s unused estate tax exclusion pass to the surviving spouse, then the value of some property subject to the marital and charitable deductions can be estimated instead of having to be precisely calculated. Line 6 talks about filing a protective claim for refund. Expenses associated with administering the decedent’s estate are usually deductible on the tax return, but there is a window of time in which they should occur. If that threatens to elapse before the return is filed, you can request an extension, which is the protective claim. Line 7 asks about QTIP property in the estate from a prior gift or estate. QTIP property is property distributed from a QTIP trust, which is usually established to take advantage of the marital deduction while providing control of how assets are distributed from the trust. Line 12 asks about transfers made under section sections of code. These refer to transfers of property from the decedent of various kinds and within three years of their death. If the decedent made any of these, Schedule G needs to be filed with the estate return. Line 14 refers to use of a general power of appointment. This is a power the decedent can grant in their will to give an individual the right to distribute property from the estate as though they were the owner of that property. Line 16 asks if the decedent received an annuity described under the instructions for Schedule I. Relevant annuities are those where the contract was entered into after March 1931, the annuity was payable to the decedent for their lifetime, is receivable by a beneficiary following the decedent’s death, and the annuity contract was not a life insurance policy. Line 17 asks for an explanation if any of the decedent’s property which they gained from a predeceased spouse under section 2056(b)(7) was not included on this estate return. This refers to QTIP property distributed to the decedent. Part 3 of the form covers some special rules which you could take advantage of. Normally, you value the property in the estate as of the decedent’s date of death, but you could use “alternate valuation.” This values property as of 6 months after the decedent’s date of death, or if distributed from the estate within 6 months of the date of death, as of the date it was distributed. You can also use “special-use valuation” for property that was principally used in the business of the decedent, if any. Lastly, Part 3 allows you to declare that you would like to pay estate tax in installments instead of a lump sum. Part 5 of the form records the values of all the property in the estate. The individual items should be listed on separate schedules and Part 5 of the form totals the values of property within a category. If you are using the special asset valuation rule Line 11 of Part 1 asked you about, you total the value of those assets on Line 10 of Part 5. Midway through Part 5, you will then have the gross value of the estate. The rest of Part 5 totals the deductions you are allowed to take. Those include the marital deduction (Line 21 of Part 5) which bears some explaining. The marital deduction allows any amount of property to pass tax-free to a surviving spouse. However, this can cause problems down the road because it doesn’t let the estate tax exclusion pass to the spouse as well. This means that when the surviving spouse dies, they will owe estate tax on all of the couple’s combined assets but have only half the estate exclusion to apply against them. It is best to coordinate use of the marital deduction and the lifetime exclusion with an estate attorney. Having finished Part 5, you now know the gross estate value and allowable deductions. These are entered on the first two lines of Part 2. Line 3b of Part 2 refers to the state death tax deduction. This is relevant because some states also have their own estate tax. Similarly to how the IRS allows a deduction for state income taxes paid on the federal income tax, your are allowed to deduct the amount of state estate taxes paid on the federal estate tax return. Subtracting out the state death tax deduction leaves the total amount of estate taxable at the federal level. Line 4 calculates how many taxable gifts the decedent has made through their life. 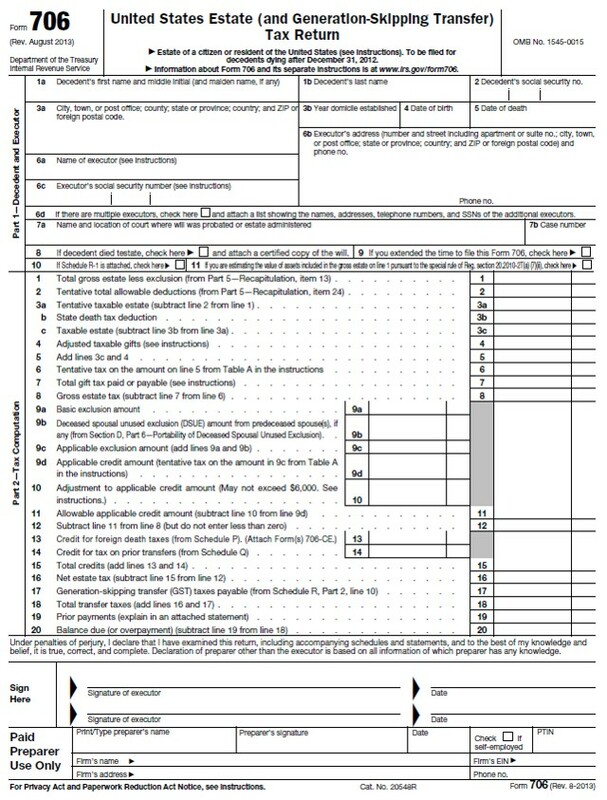 The instructions for the estate tax return have worksheets to help you with this and with lines 6 and 7. Line 6 gives a tentative amount of tax on the decedent’s current estate and all their lifetime taxable gifts. Line 7 factors in the credits the decedent was allowed against their prior gifts and brings you to the total amount of gift tax due with this estate return. Lines 9 through 11 involved the amount of estate tax exclusion you can apply. It starts with the normal amount you could apply in line 9 ($5.43 million in 2015), then adds any bonus exclusion the decedent has that was passed to them by a spouse that predeceased them, which is calculated by Section D of Part 6. (Line 9d refers to Table A in the instructions for the estate tax form. Table A is on the first page of the instructions for Part 2.) Line 10 won’t apply to most returns: it handles a specific adjustment that needs to be made if the decedent made any taxable gifts between September 1976 and January 1977. Lines 13 and 14 handle two less-common estate tax credits. Line 13 is for the foreign death tax credit – you may be able to claim a reduction on your federal estate tax return if you paid death taxes to a foreign government. Line 14 may offset estate tax due on property transferred to the decedent by a person who died 10 years before or 2 years after the decedent. Line 16 nets all of these credits against the gross estate tax on Line 8. This is your estate tax due. Line 17 adds in any Generation-Skipping Transfer Tax due, which is calculated on Schedule R. Again, this surtax applies to taxable gifts made to a relative two generations younger than the decedent, usually from grandparent to grandchild. And finally, line 20 totals estate tax due with the Generation-Skipping Transfer Tax and you know how much is owed with the estate tax return. Section A allows you to check a box to deny the decedent’s surviving spouse the ability to inherit the decedent’s unused estate tax exclusion, but there is no reason to do that. Section B asks if you are transferring assets to a Qualified Domestic Trust. Qualified Domestic Trusts are a way to allow the estate to give property to a surviving spouse who is not a US citizen while also benefiting from the marital deduction. This will probably not apply to many filers. Section C is simple arithmetic. Part 6 takes the decedent’s total estate tax due, subtracts from that the value the amount of gift taxes paid over their lifetime, then subtracts out the amount of net taxable estate you calculated in Part 2. This yields the amount of unused estate exclusion that can be passed to the decedent’s surviving spouse. Section D is only relevant if the decedent had a spouse that predeceased them and passed on their unused estate exclusion. This section records that amount. The estate tax return is definitely complex, but that’s because it has to account for the multitude of special rules that only apply to a few households. Hopefully, using this guide and the instructions for the form, it doesn’t have to be the burden it initially appears to be.